It isn’t just the speech that makes King stand out, however. 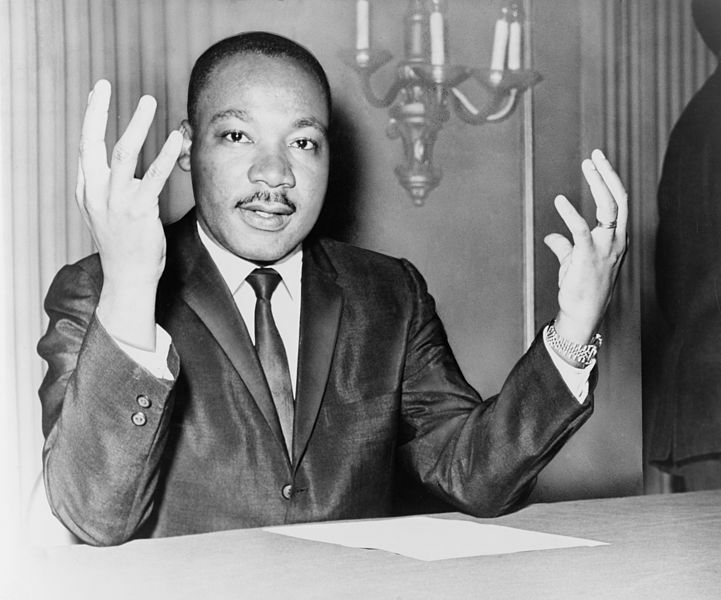 In addition to being a powerful speaker, King was a champion of nonviolent activism. Tactics such as sit-ins sought to capture the public’s attention and force them to be aware of the discrimination occurring in racially-segregated restaurants. One of the strengths of a non-violent approach is that any retaliatory action on the government’s part just makes the protestors easier to support – they appear as underdogs suffering under the iron fist of big brother. 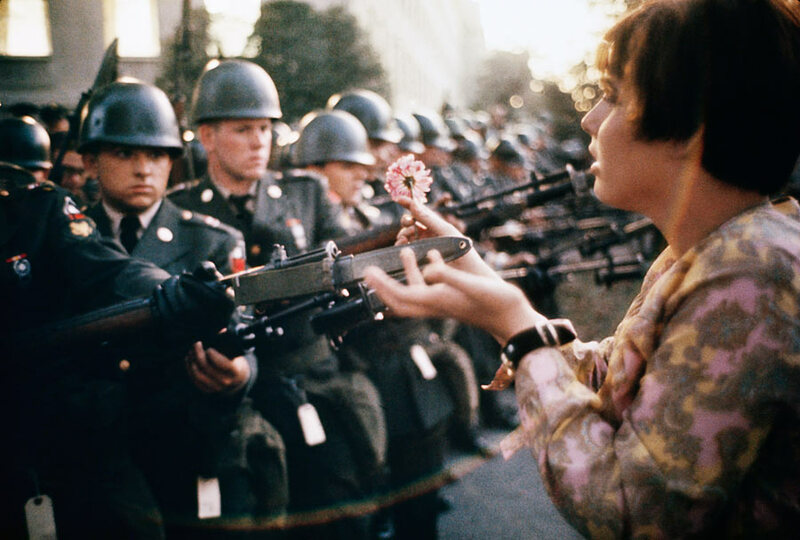 Perhaps the best summary of nonviolent activism is simply Marc Riboud’s photograph of an anti-war protestor offering a flower to a soldier. Marc Ribaud, “Jeune fille à la fleur (variante),” October 21, 1967. Act Like an Adult, React Like an Adult. Think before acting or speaking. Ask yourself how you’d respond if your kid acted this way. Would you tell them to grow up, or would you be proud of them? And in that case, should you really say or do what you’re thinking of? Most of the time, this is easy. It gets hard when you’re angry and upset – but this is when it’s most important. It’s also difficult not to retaliate when your (soon-to-be) ex slings an insult at you. But think about it – isn’t it better if he just looks childish and petty? Meet insults, hostility, and threats with calm dismissal. Your ex wants you to get angry and snap back at them – that way they can justify their attacks on you and feel like the “good guy.” Refusing to address their insults robs them of this satisfaction. That way, you get to be morally superior while not giving your ex what they want. Win-win. If you have kids, they’re learning what divorce is like right now. More importantly, they’re also learning how to interact with people who you’d rather not talk to. If you talk bad about your ex to your kids or are hostile with them, you’re teaching your children that this is the right way to act with someone you don’t like. Instead, show them that adults interact calmly and maturely, no matter what conflict there is between them. Be prepared to address your ex’s behavior if they cross a line. For example, if your ex shows up at your house without permission, harms you, or threatens to harm you, call the police. Nonviolence does not mean non-action! Take the proper steps to report and handle your ex’s behavior. Keep your reaction to the behavior private – don’t publicize what happened or seek sympathy from social media. If your ex acts out, they’re looking for a reaction from you. Don’t give them one. Taking a nonviolent, mature approach to your divorce keeps you out of the wrong and provides a well-behaved example to contrast your ex’s behavior against. And in ten years, you’ll be able to look back and be proud of how you handled your divorce.